The summer of disappointing blockbusters plods along with this utterly unnecessary sequel that does very little to improve on the groundbreaking work of its predecessors. Jason Bourne is 9 years removed from The Bourne Ultimatum, the third film in what would have best remained a trilogy, and the time gap couldn’t be more evident in the final product here. When director Paul Greengrass and star Matt Damon chose to reunite for another Bourne film this late in the game, one could have only hoped that it was because they had something worthwhile still to say with this character but any seeds of a promising idea are obscured by clumsy execution. The perfunctory plot brings back superspy Jason Bourne (Matt Damon) as he once again tries to discover who he “really is”, this time by uncovering classified CIA documents with the help of computer hacker Nicky Parsons (Julia Stiles). 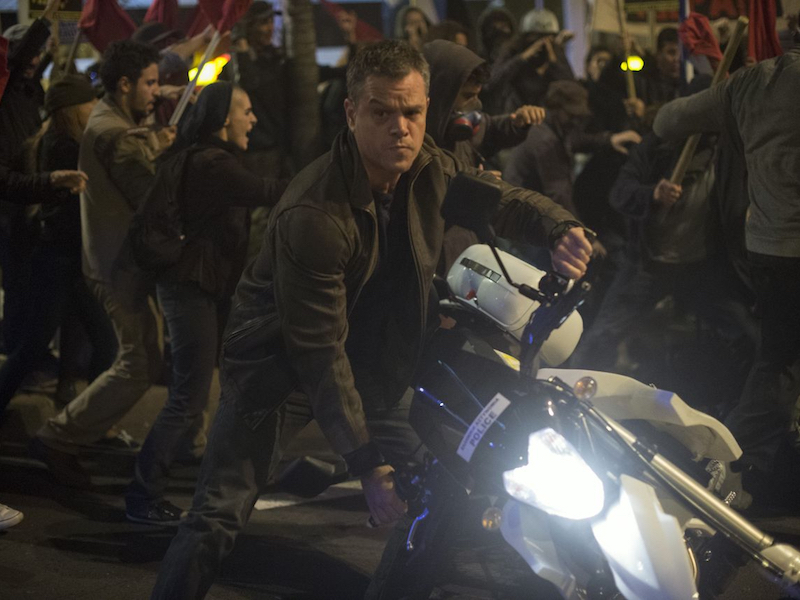 Their breach draws the attention of cyber ops director Heather Lee (Alicia Vikander) and CIA director Robert Dewey (Tommy Lee Jones), who surveil and attempt to extract Bourne as he travels from Athens to Berlin to London. The pursuit comes to a head at a tech convention in Las Vegas, where social media mogul Aaron Kalloor (Riz Ahmed) plans to unveil the new app Deep Dream that has been co-developed with the CIA for covert mass surveillance. It should be the goal of any sequel to build upon the story that’s already been laid out in one way or another but this film feels like a regression in nearly every sense. It opens with the title character declaring “I remember everything” in voiceover and then we cut to grimy flashbacks from previous entries in the series, just in case the audience has a hard time remembering too. What’s problematic with this approach, beyond being painfully conventional, is that this introductory assertion is obviously false; if he really did remember “everything”, he wouldn’t have anything left to learn about his past and we wouldn’t have a new movie on our hands. Even if you’re not interested in sophisticated storytelling and you just want to see some reliably rousing action sequences that rival those from the first three films, you’re still out of luck. Greengrass falls back on his trademark “shaky cam” cinematography and frantic editing to create scenes that feel more incoherent and less involving than they could have been with a better establishment of physical space. In the case of chase scenes and hand-to-hand combat in particular, how can we care about what characters want and where they’re going if we never get a good sense of where they are in the first place? There’s not much care taken on the acting side of the equation either, although rising stars Vikander and Ahmed bring what they can to their limited roles. Tommy Lee Jones doesn’t even attempt to conceal his apathy for the material and Matt Damon turns in a borderline bad performance in his fourth outing as Bourne, giving further credence to the concept that this character has already been rung dry by this point. Jason Bourne is an action sequel so uninspired and forgettable that not even its title character would try hard to remember it.